Election season for me is always a little bit more personal because of my upbringing as part of a political family, whose involvement in politics now spans two decades. 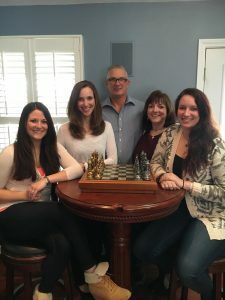 Caitlyn Picard | Picard (far right) sits at a game of chess with her family, including her father (center). This photo was recently used for one of his campaigns. I’ve been helping out with campaigns ever since I can remember, riding in the back of the car with flyers, as my dad and older sisters walked door to door. I was recruited to help stuff and mark envelopes, as well as to help volunteer at fundraisers. It became second nature to me, a familiar backdrop to my childhood. It was a family affair; taking pictures for ads, being out on the campaign trail, going to inaugurations — all of it. My whole life I have been around politics in one form or another, and it has helped me grow to have my own opinions about the issues going on around me. I’ve had an inside look at the way government works that most people will never get to see. I’ve seen my dad work past the six months of session, spending late nights at the State House while still holding a regular job and being there for my family. I’ve seen him put in more hours than he may be credited for. I’ve seen him stop eating to have a 20-minute conversation with a constituent. I’ve seen all the amazing things he has done for his community and the pride he takes in all of it. So understandably, one thing that really gets to me, which can be clearly seen in light of this election, is when people say all politicians are crooked. I can remember going to the State House when my dad had a session with a representative. The representative that sat next to him always had Twizzlers in his desk and would share with me every time I was there. I remember going to political functions, mostly fundraisers, and all the elected officials there would always be so nice and make sure my mom and I had whatever we needed. As I got older, I got to work at the State House and talk to these politicians in a different way. I’ve had the chance to get to know a good handful of them on a different level and they are some amazing, hardworking and very personable people. Before even knowing who my father was, a good majority of them were always friendly and asking how I was doing or what I was up to. All throughout my life, I have had countless people, some politicians, but not all of them,, come up to me and tell me how great my father’s actions are and how politics could use more men and women like him. I may not be able to argue that there are not politicians out there who are crooked and only in it for the money. This corruption can be easily seen in our political history, but I have to argue that one cannot say that all politicians have been swayed. I was given a different opportunity than most in getting to actually come to know the people that make laws for Rhode Island. I may be considered biased because of my father, but it doesn’t go against what I have come to know about some politicians. People cannot look over those who are working for the right reasons. You cannot lump them together because that’s where the thought that politics are corrupt comes from. Our political system could use some work, yes, but there are those who are fighting for the right reasons in the right way – and those are the ones that often get overlooked. I am thankful for my dad having held a seat in the State House for over 20 years, because I personally have had the chance to learn so much about government from a young age. I learned how important it is to go out and vote, something I will be doing on Nov. 8. I’ve learned that, by going out and voting, it is easier to put people like my father in a position where they can change things for a community they love. Since I’ve been exposed to politics my whole life and have seen the positive effects throughout Rhode Island because of certain representation, I now hold voting to such a high standard.